Summarize the cell cycle and explain why it goes in that order? Cell Cycle is just when your cells grow then that’s when your body grows and gets bigger then how it use to be.The cell cycle goes in that order because if it didn’t you would not grow. Cell Cycle is when your cells grow and when that happens is when you grow. When your cell grows it divides and it forms two cells. Then after that the two cells grow and make four and then they make more and more and more. This process of cell growth and division also happens in your body and that’s how you grow. During the cell cycle the cells grow then they get prepare to divide then they make more and does other ones are called “daughter cells”. The cell cycle is divided into three main stages they are interphase , mitosis, and cytokinesis. 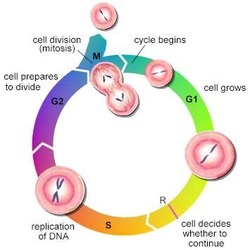 The cell cycle goes in that order because if it went in another way then you would not grow or anything that has cells would not grow.The cell cycle goes in that order because it cannot go in another order because if it did you would not grow at all. The cell cycle is a process in which a cell grows and divides to create a copy of itself. Some organisms reproduce through the cell cycle, the cell cycle is used to allow the organism to grow, and to replace cells as they grow worn out. In animals, the whole cell cycle takes around 24 hours from start to finish. Some cells, such as skin cells, are constantly going through the cell cycle, while other cells may divide rarely, if at all; neurons, for example, don't grow and divide once they are mature. It goes in that order because that’s the order that the cells have to go in but the animal cells is different because when they get big they don’t make new ones they stay when they are mature enough. "What Is the Cell Cycle?" WiseGEEK: Clear Answers for Common Questions. Web. 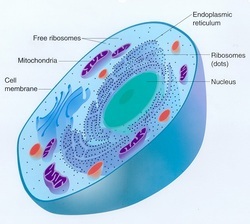 01 Dec. 2011. http://www.wisegeek.com/what-is-the-cell-cycle.htm. The cell cycle is all the cells that grow and divide too make new ones so your organism could grow. This process starts with interphase,in which the cell starts out in a resting state and then starts to prepare itself for division. In interphase, the cell makes two sets of its DNA, and the organelles in the cell also double themselves. 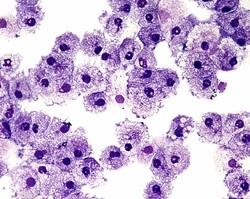 As these processes occur, the cell also grows in size. At the end of interphase, the cell has twice the amount of material it needs, and it can start mitosis, in which the material migrates to opposite ends of the cell so that the cell can split in two, making two new cells. The cell cycle is also used during fetal development to allow a single fertilized egg to develop into an entire organism. "What Is the Cell Cycle?" WiseGEEK: Clear Answers for Common Questions. Web. 01 Dec. 2011. <http://www.wisegeek.com/what-is-the-cell-cycle.htm>.